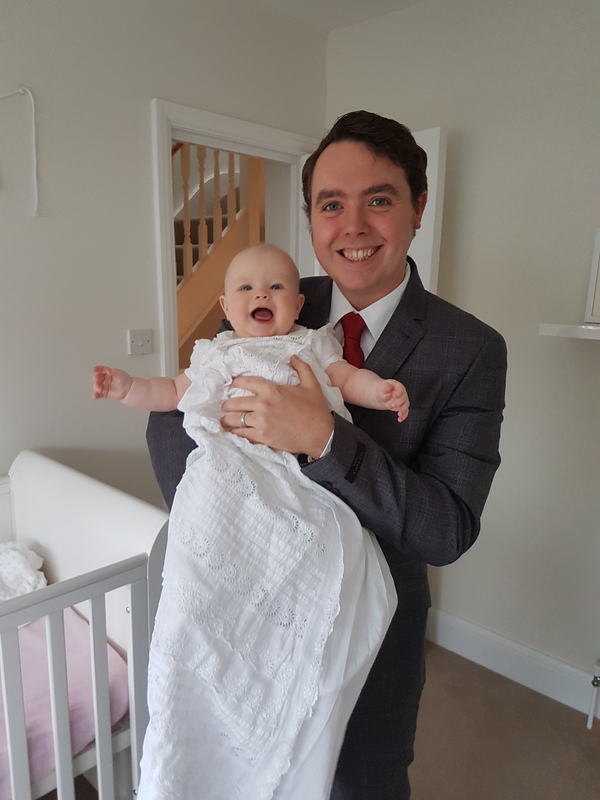 On October the 16th, we christened my daughter Penelope. Having family and friends come along for the service, next to our new house in Motspur Park, felt like a milestone in our lives. When we first spoke about the Christening, my Mum mentioned that my Gran had looked out the gown that I was christened in. I thought it sounded really nice to re-use the gown, and a lovely symbolic link across the generations. What I didn’t know, however, was that I wasn’t the first to be christened in it. My Gran’s maternal grandfather was christened in the gown in 1862 and I was the fifth generation to be christened in it. With my Mum, my grandparents and my family in attendance, my daughter was the sixth. 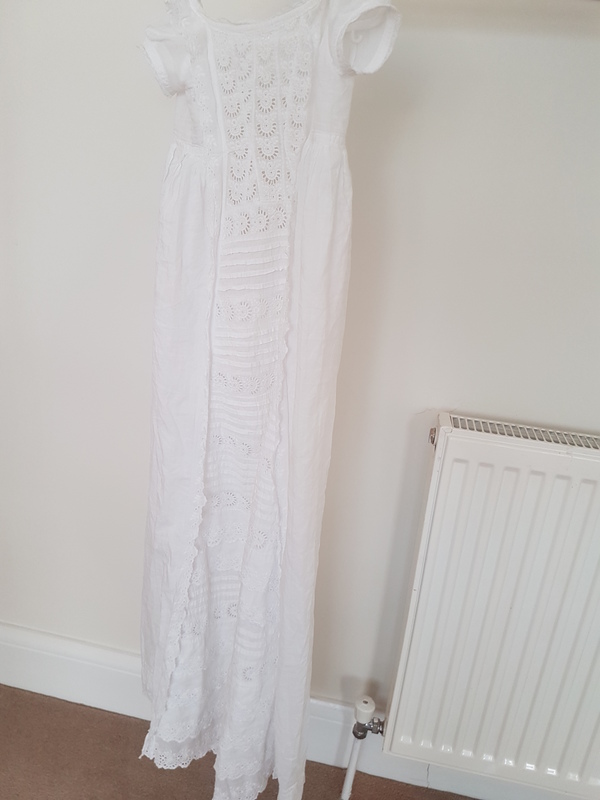 The gown, which looks like an example of Ayrshire whitework or broderie anglaise, was likely made somewhere near my Gran’s place of birth, near Glenelg in the Highlands (I’m grateful to Fabrice Bensimon and David Hopkin for looking at photos of the gown to talk to me about how it was likely made). She grew up in a small village called Ault a’Chruinn at the foot of Sgurr na Moraich (a peak which is one of the famous Five Sisters of Kintail range). My Great Uncle Donnie still lives up in the village, and we used to drive up for family visits once or twice a year when I was growing up. Living down in London, I don’t get to visit as often as I’d like now, though my Mum and my Brother frequently drive up north to say hello. I have fond memories of my childhood visits there, and it always seemed a world away from my family home in suburban Glasgow. We usually spent our entire time up there in wellies, noses red from the wind and clothes muddy from playing outside. For my brother and me, it was a huge playground with limitless possibilities. We would clamber up the low rolling hill to swim beneath waterfalls, or play beneath the causeway, building our own little dams out of sticks and stones. Even now, I have pictures of that landscape hung in my house in London. The area retains an air of idyllic (and rustic) rural charm, only intensified by the fond memory of family visits. Thinking about that landscape, and how little it appears to have changed, seems all the more poignant when I’m holding that family gown from 1862. In its white cotton finery, it binds joyful moments across generations right back to the mid-nineteenth century. Yet beyond those joyful memories, it also made me think about the changes in that landscape, and the history that lay at the foot of those hills by Loch Duich. Looking into that history reconnected me with little bits of idle research that I had done into the area, and connected me rather oddly back to the themes I look at in my own work. I’m inspired, in part, by the contextualising drive of Alison Light in Common People, and her desire to learn more about her family. This short post can’t hold a candle to her insightful exploration of her family, though it is framed by a similar desire to understand my own links to the past. In pursuit of this, I find the contextual detail dragging me in different directions. As Light said, this sort of family focus puts you in the role of trespasser, “disregarding the boundaries between local and national, private and public, and ignoring the hedges around fields of academic study; taking us by surprise into unknown worlds.” With that roguish gait to my step, my first thought was to pick back up James Boswell’s The Journal of a Tour to the Hebrides with Samuel Johnson (1785) as a historical starting point. I’d used this when thinking about objects with students during a summer school at UCL, and the fact that it cropped up in my teaching made it seem an appropriate first step. In the book, Boswell the famed diarist discussed his visit to Kintail with his great friend and travelling companion Johnson. Amongst the rugged landscape in which my brother and I had made our playground, Boswell describes meeting the clan he called the “M’Craas” on 1 September 1773. Strikingly, he described them as like “a tribe of Indians… but not so terrifying.” They were hospitable, but wild, and inscrutable in their customs to the cultured travelling pair. In this encounter, and in the language that was used, it is amazing to me that Boswell’s description applies to the same place that my Gran grew up, to the people that were our ancestors, and indeed the relatives from whom that gown originated less than a hundred years later. The gown came from my Gran’s maternal grandfather (my own great-great grandfather, and a McAskill), though her father’s side of the family (the Macraes) were perhaps the more well-travelled. Macrae is my grandmother’s maiden name, and both mine and my daughter’s middle name. Their travelling is a clue to the ways the landscape did change, however. My Gran’s father, Alexander (Sandy) Macrae, was part of a generation of Scottish people that travelled to North America, exploring options in an expanding world. He and his brother Duncan went to work on a sheep farm in Montana in 1908, their brother Farquhar had emigrated to Georgia in 1906. Sandy visited Kintail again in 1914, homesick and missing family, though remained in Scotland as the Great War broke out. This was a generation that commonly travelled, unsettled by the Clearances which saw sheep introduced to the landscape to maximise rents for lairds, displacing families from productive glens towards the shores of the lochs where life was harder. My Gran was told by her great aunt Maggie that, as part of this process, some of the Macrae family had moved to Nova Scotia around 1850. 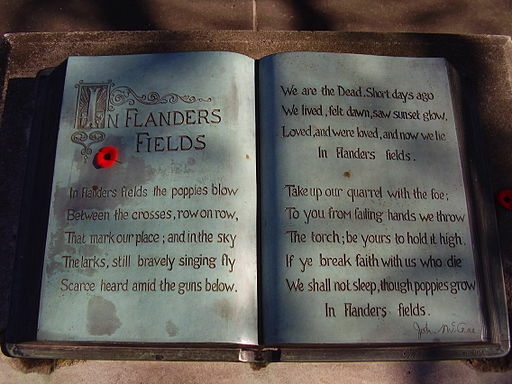 Recently I found out that one of those links was my great-great grandfather’s cousin, John McCrae, who famously wrote ‘In Flanders Fields’ in 1915. That poem has become a marker of international memorial, and a formative influence on the way we think about the Great War. Conflict has always been something best understood on a variety of scales and ‘In Flanders Fields’ serves best perhaps as a shifting contrast between brutal war and pastoral respite. Yet, in its evocation of a Canadian soldier fighting and killed in France, the poem is itself an indication of the Great War’s global impact, and of generations of Scottish emigrants. Yet it can be easy to think only of these global connections in the twentieth century, and indeed it is doubly tempting for me as a contemporary historian. 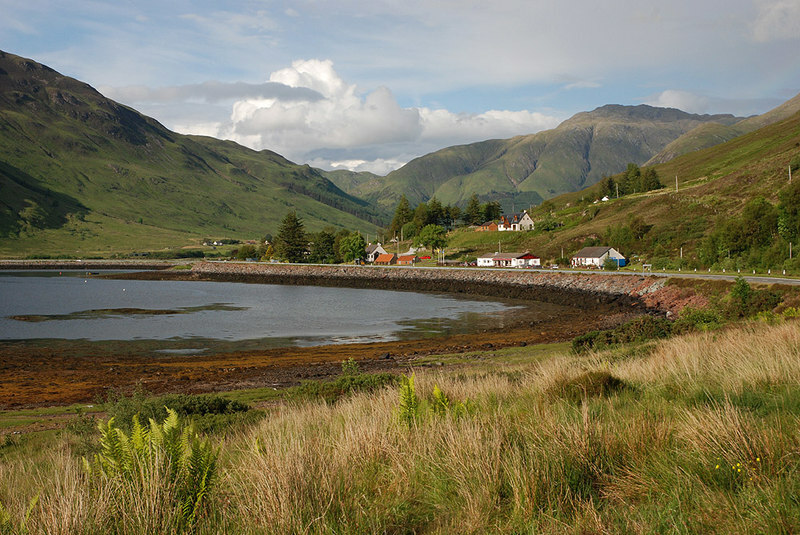 The Macraes had a longer history of global entanglement, however, stretching from the rugged landscape of Kintail to the farthest reaches of Empire. Shortly after Boswell’s visit to the community, the Macraes would again make international news, after a regiment of the Seaforth Highlanders mutinied in Scotland’s capital during the “Affair of the Wild Macraes”. As in Boswell’s tale, the men levied from Kintail seemed culturally aloof from the main stream of British culture. Very few of the Gaelic speaking soldiers would have spoken English (as their officers did), and this was not helped by orders given in 1777 that mandated all orders should be given first in English then explained to any that didn’t understand. So it was that when the regiment levied by the Earl of Seaforth was pledged to the service of the East India Company, nobody got round to telling the fighting men. Their ill-fated resistance against the forces of empire, and their subsequent co-option into its defence, chimed with my work on rebellions against imperialism elsewhere. The link to the East India Company also struck a chord given the research centre at UCL, where I work. Likewise, it seemed their involvement in conflict against the forces of French imperial expansion offered a more direct link to my own research interests in the Francophone world (explored most recently in Britain, France and the Decolonization of Africa: Future Imperfect?). Barke’s rural tale sounds, to me, a lot like a story from my own book Terror and terroir, albeit spiced up with the license of fiction and set in a different rustic landscape. Campaigning peasants of the Midi took up the Occitan slogan “volem viure al païs” (we want to live in our land), and pushed for a viable future rooted in the soil, and rejecting mass tourism as an alternative way of life. Yet this book also revisits the themes that sparked the 1778 revolt (Gaelic speakers being pressed into systems they had no stake in) as well as the Clearances that had cast a Scottish diaspora across the Atlantic. What it has in common with all of these is the way in which its narrative is fixed upon the rustic landscape of Kintail. In the book’s evocation of the landscape I was transported to my own past, though reminded also of the different global conflicts that had touched on the history of the place. Internal colonialism, rebellion against empire, the politics of memory, and rural resistance: these are themes which I would automatically point to in my own work. Yet, I was fascinated by the way that the gown in which I christened my daughter conjured up these links and these memories. Its entangled thread reached backwards and forwards into time, across continents and generations. The gown connected my own childhood with hers, and my academic research with the history of my own family. The personal bonds to broader events enriched the global entanglements stemming out from the banks of Loch Duich. I’m struck by the potential for looking backwards into our own past, and also by the complacency with which I fail to do so more often (given that I’m a historian for a living). Considering the interaction of landscape, objects and family connected a number of global narratives with my own research, my own memories, and my family. A. Light, Common People: The History of an English Family (Penguin, 2016), Introduction. Interestingly, there was a famous TV Series made about a cattle drive in Montana, Lonesome Dove (1989), which features a character called Gus McCrae (played by Robert Duvall). A coincidence? Who knows. At this stage, they were the 78th (Duke of Albany’s Own Highlanders) Regiment of Foot. They were renumbered as the 72nd (as which they were better known), in 1786. As per the NAM: ” Kenneth Mackenzie, the recently reinstated Earl of Seaforth, began recruiting in the western Highlands of Scotland as a token of thanks to the Hanoverian Crown. His family had originally forfeited their title and estates for their support of the Jacobite Rebellion in 1715.” The Macraes had traditionally been known as “Mackenzie’s shirt of mail” and had fought for the Jacobite cause. At the Battle of Sherrifmuir, 30 Macraes from Kintail were killed. A monument at Sherrifmuir marks this as does a plaque on the wall of the old church at the burial ground Clachan Duich on the other side of the loch from my Great Uncle Donnie’s house.